Access to Harvard Business Publications is provided to staff and students through the Library under special conditions. If you are a staff member wishing to use this resource, please refer to the Library's Harvard Business Publishing Staff User Guide. This guide will instruct you on how to create an Educator Premium account which will allow you to browse Harvard Business Publishing resources and request student copies of these materials. After registering, follow the instructions on the staff user guide on how to send an email request for student copies. A Library staff member will respond to your request and send you authorised links to Harvard Business Publishing content which you can use when creating reading requests on Readings Online. If you need any assistance with registering an account or accessing Harvard Business Publishing materials, please email harvard-publishing@unimelb.edu.au. Please contact Readings Online if you need assistance in creating a reading request for Harvard Business Publishing material. To save a link to this page go to the abstract page for the article you are after. Copy the URL from the browser address bar. 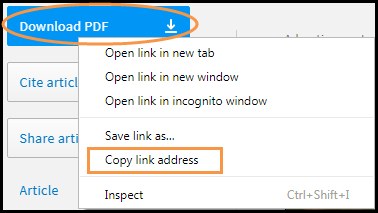 Go to the required journal article and right click on the PDF link and use Copy link address option to save the URL as your link. 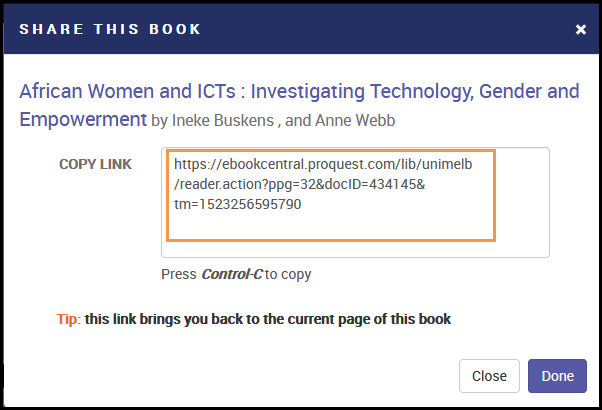 Go to the required book chapter and right click on the PDF link and use Copy link address option to save the URL as your link. Locate the book/journal in EBSCO and click Permalink in the Tools menu on the right. Copy and paste the link from the permalink window. After you have located the article right click on the PDF and use this URL as your stable link. Copy and paste this URL to use as your stable link. Locate the article in HeinOnline. Select the option that looks like a chain. This will produce a permanent link to the page. Copy and use this as your stable link. Go to either the abstract or the PDF for the journal article you’re after and in the citation details you will find a permalink inside <> triangle brackets, this URL can be copied and used as the link for the article. To locate the Stable URL for a Journal/Book chapter, click the title of the resource - a new page will open and then you can find the Stable URL under the title. 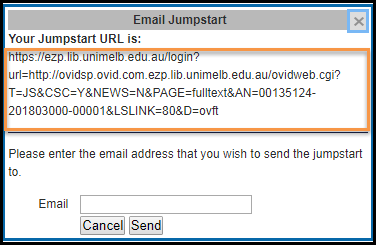 Go to the full text of the book chapter you are after and click on the 'Email Jumpstart link' from the top right of the page, then copy the URL from the pop up box that displays and use this as the URL for linking to the book chapter. 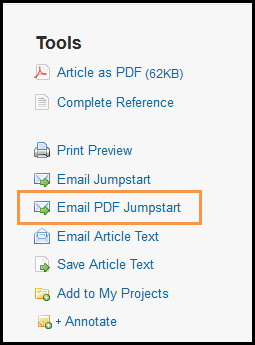 Locate the required article and right click on the PDF and select 'copy link address'. Save this URL as your link. Go to the Contents page for the subject and scroll to the contents entry for the chapter you wish to link to, then right click on the chapter title link and use the ‘Copy link address’ option to save this URL to use as your link. 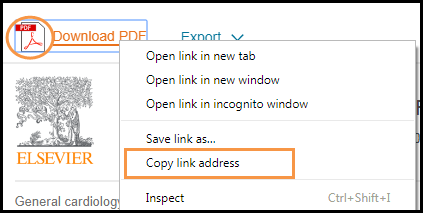 Go to the full text PDF of the journal article you are after and right click on the ‘Download PDF’ button and use the ‘Copy link address’ option to save this URL to use as your link. Go to the full text PDF of the book chapter you are after and right click on the ‘Download PDF’ button and use the ‘Copy link address’ option to save this URL to use as your link. Go to the Abstract/Details page of the journal article you are after and scroll to the bottom of the screen and copy the URL in the field labelled ‘Document URL’. Right click and copy the link. Once you have searched for your book click on the 'share link to book' and copy this URL to save as your link. 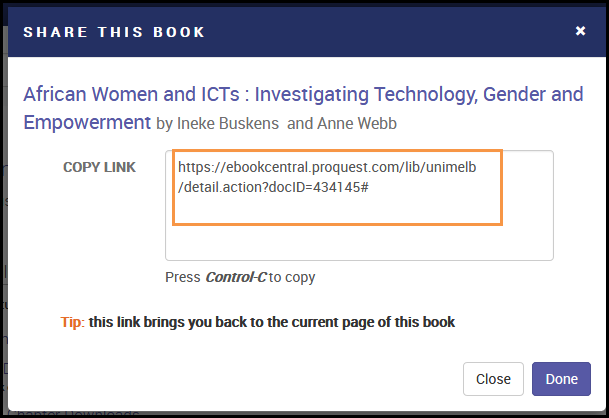 Locate the required chapter from the contents page and at the top of the page click on the chain icon and use this URL as your link. Go to the full text PDF of the journal article you are after. Locate the chapter in Sage and select Download PDF. Go to the Citation/Abstract page of the journal article you are after and right click on the PDF download link at the top of the screen and use the 'Copy link address' option to save this URL to use as your link. Go to the required chapter and right click on the PDF link located under the chapter title and use the 'Copy link address' option to save this URL to use as your link. Locate the required article and click on the PDF option. 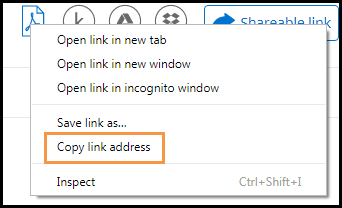 Copy and paste the URL from the address browser bar. In the contents page of the book open the required chapter and copy the URL from the browser address bar. You can deep link to a set of results or documents in Westlaw AU. Select the 'Get link' option (the icon is a chain). A pop up box will appear with the URL information. NB: it is not possible to hyperlink to University of Melbourne Westlaw AU content in Microsoft Office documents (e.g. Word and Excel). 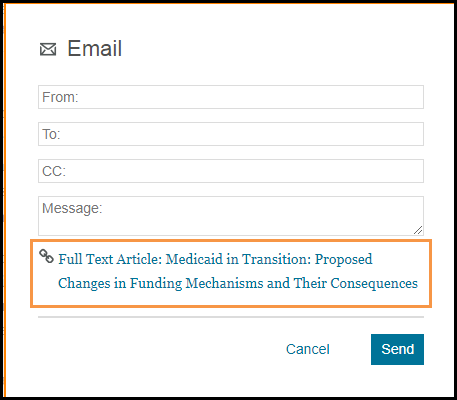 If you need to link users to Westlaw AU content from a Microsoft document it is recommended that you include the link as text (rather than a hyperlink or text embedded with a link). Westlaw AU generates long links and it is recommended that you use a URL shortener if you need to link to Westlaw AU content in a Microsoft Office document. Go to the abstract of the journal article you are after and right click on the PDF link and use the 'Copy link location' option to save the URL for linking to Wiley Online Library articles.